An intriguing act for a variety of reasons, if primarily for the vacuum they are filling, Philadelphia’s Devil Master is, at the present time, one of the scene’s most heaped-upon newbies. Formed in 2015, the band (all six of ‘em) got picked up by Relapse after the release of their 2017 Inhabit the Corpse EP, which is the primary pace-setter for what was to come, specifically, a kamikaze of d-beat, punk, black metal and necro death metal. 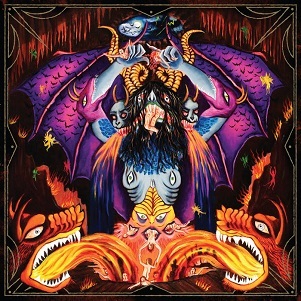 It’s a whimsical blend indeed, but on their first proper full-length, Satan Spits on Children of Light, Devil Master pulls it all together, essentially making this sound, their own. The black metal angle is probably what will get most people onboard. Devil Master is like Deathcrush-era Mayhem, but better instrumentally (sorry, Euronymous) and a bit more on the level, which, if you’ve listened to early Mayhem, you’d understand. So, the rollicking, perpetual tumble of cuts like “Nightmares in the Human Collapse” or the hearse-riding “Devil is Your Master” are what could happen if a punk band armed themselves with the grit and darkness of black metal and buffered it with better-than-good playing ability. The psychobilly onslaught of “Christ’s Last Hiss” as well as the Killing Joke-inspired “Nuit” both teeter on the ledge, with Devil Master practically daring the listener (and themselves) to take the dive along with them, all the while, a set of searing melodies came raining down. (The album’s extremity is oftentimes buffered with these measures — and rightfully so.) By the time album highlight “Her Thirsty Whip” enters the fray (or party), Devil Master has already asserted themselves as masters of a realm not quite traversed. All the more reason to start Satan Spits on Children of Light all over again from the beginning.